Nigeria international striker Bright Dike is confident he can make an impact at his first European club side, Amkar Perm, in Russia. Dike was released by Toronto FC in August following an injury-ravaged spell with the MLS side. He signed a one-and-a-half-year deal for Amkar after impressing on trial, and is excited about the task ahead. "This is a challenge and I am relishing it," the 29-year-old told BBC Sport. "Being my first European club I am under no illusion about how competitive this is going to be, but I'm mentally prepared. "European football is highly respected and I am very happy to be here" he added. US-born Dike's move to the Russian Premier League follows the late flourishing of a career that began at Portland Timbers and has involved spells at Los Angeles Blues, San Antonio Scorpions and Toronto FC. Despite stepping outside North America for the first time, Dike has lofty ambitions and is determined to emulate his cousin and West Ham striker Emmanuel Emenike by becoming a star in Russia. "I remember Emmanuel [Emenike] played here in the past and people still talk about his performance," he said. "It's always good to know that his success precedes my arrival, an indication that I am condemned to make my own mark and be successful. "I hope to make a good contribution on the pitch, help my teammates and hopefully achieve success collectively." As he looks to make up for lost time, the player says he is prepared to defy the cold weather and language barrier to succeed at the Zvezda Stadium. "There are six players here who communicate in English, I've also started taking Russian lessons and to have my good friend Fegor [Nigeria international Fegor Ogude] here also helps," he added. "The weather will be a little colder than Toronto but I think I will get used to it. To succeed as a footballer you need to overcome several challenges." 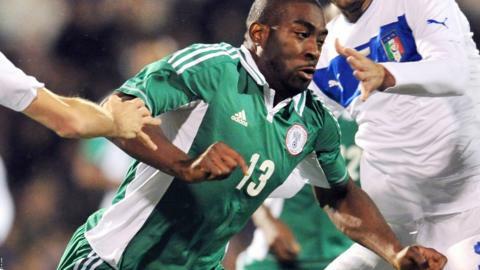 A torn knee ligament and two Achilles injuries have had a devastating effect on the career of Dike who made his debut for Nigeria against Venezuela in November 2012. His first international goal against Catalonia in January 2013 was not enough to earn him a place in the 2013 African Cup of Nations squad. Five weeks later he suffered a torn knee ligament in a pre-season match against Seattle Sounders FC, ruling him out of action for six months. He returned from a long-term injury to score his second goal in as many starts for the Super Eagles in their 2-2 friendly draw against Italy in November 2013. Dike suffered another setback as he was ruled out of Nigeria's 2014 World Cup squad after surgery on an Achilles injury in February 2014. As well as being the cousin of Emmanuel Emenike, Bright Dike's sister Courtney is also a footballer. She represented Nigeria at the 2014 Fifa U-20 Women's World Cup where she scored the fastest goal in the history of the tournament.